I’m revising my site organization to include all the Vatican II documents on fewer pages. These are not popular finds from the main menu, and since WordPress doesn’t easily allow me to manipulate how “pages” are displayed, this is the best I can muster. 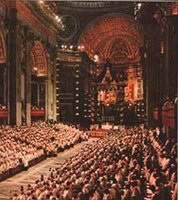 Here are the outlines and hyperlinks for the conciliar constitutions, the documents on Liturgy, the Church, Divine Revelation, and the Church in the Modern World. 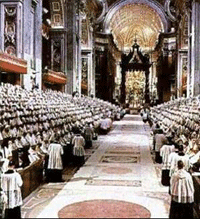 Sacrosanctum Concilium, the Vatican II Constitution on the Sacred Liturgy. The chapter headings are as they appear in the document online. Dei Verbum, the Dogmatic Constitution on Divine Revelation. 2. How does God reveal himself to people? Gaudium et Spes, the Vatican II Pastoral Constitution on the Church in the Modern World. Chapter headings follow, plus a very brief summary of each section. 3. What does the Church have to say to the world? 33. Human mastery: to what end?